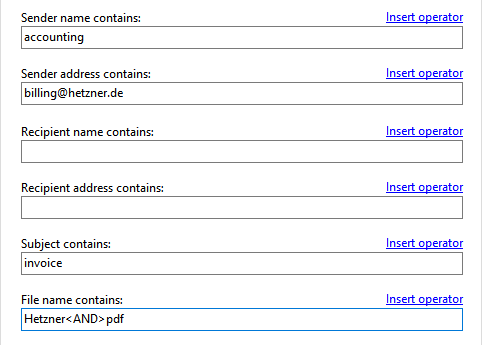 The program for automatically extracting email attachments from Outlook. The program supports the creation of an unlimited number of profiles to be able to make separate settings for different email accounts. Furthermore, you can extract subsequently attachments from emails of a certain period or from any email of an Outlook folder. To ensure that email attachments are only extracted from certain emails, numerous properties of an email can be used as a filter criterion. All criteria can be combined. Only if all filter criteria are met, the attachment of the relevant email is saved. 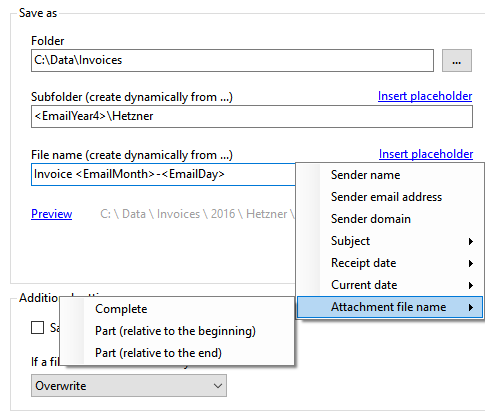 For example, with Outlook Attachment Extractor, you can create a specific rule for storing email attachments to process only emails containing a specific term in the subject and a PDF file as attachment. If required, the location where the attachments extracted from the emails are saved can be put together dynamically of properties of the emails. For example, the receipt date of the email or the name of the sender can be used as a subfolder. Furthermore, a part of the attachment file name can be used for the folder or file name of the attachment to be saved. The program is aimed at users who receive frequently or at regular intervals emails with Outlook containing an attachment that should be archived or processed automatically. This can be, for example, the monthly bill or a zip file, which should be stored in a specific directory and is handed over to a specified program as parameter for further processing. Especially on a large number of incoming emails, a manual inspection and sorting of the emails can take a long time to complete and binds a lot of work performance. 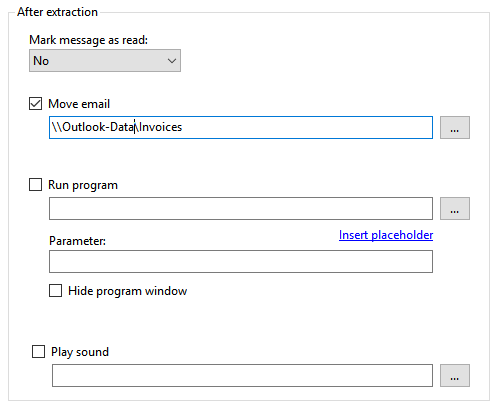 Outlook Attachment Extractor can perform these tasks after a single set up automatically in the background, saving you time. The software is easy to configure and offers through the support of multiple profiles the possibility of adding flexible filter rules to apply them individually to an email account. Since you can also apply multiple profiles to an email account, the attachments from emails can be stored, for example, depending on the sender or subject in an individual directory. Thus, attachments of certain email types can be stored in directories which are automatically created from the receipt date or from a part of the file name of the attachment. For other email types, for example, the sender's name could be used as a storage folder for the email attachment. Automatic Email Processor is the complete solution for Outlook to store and print incoming emails and their attachments automatically. For this, various filters, flexible configuration options, such as individually definable storage folders and the possibility of subsequent processing are available.